How To Lower your Moving Cost! On top of offering all these affordable services to you. We at EasygoMover don’t mind giving you some helpful advice on how to lower the cost. Any move that covers a distance of 50 or fewer miles is categorized as “local moving,” or an interstate. A full-service move can include boxing or packing up household goods, loading, moving, unloading and unpacking. Simple moving services might just include helping people unload a moving of household items into a storage unit. Pricing a local move into a new home or apartment is not always simple. Various additional costs and extra charges could increase the total bill if homeowners do not give clear details when asking for a price quote. 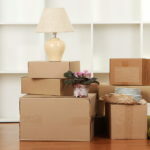 If movers have stairs to climb, extra stops to make, or specialty items and fragile things to move, costs will increase. If we can’t park the truck close to the destination, prices may also go up to account for the extra distance carrying boxes and furniture. In general, the larger the house and the more large and heavy furniture to be moved, stairs and distance the truck from the destination, the higher the moving cost.Although estimates may increase based on the number of boxes, whether packing services are needed and other variables. Following a sample of how others company charge hourly like a three-bedroom house should take four professional movers about nine hours to move locally. So at a rate of $25 per hour per worker, that would be an average cost of $900 per job, before the tip. A studio apartment might only take two movers five hours to do the job, with an average cost of $250. Full-service moving includes a moving truck and moving boxes, labor for packing household items into boxes, loading boxes into the moving truck, driving boxes and furniture to the new location, and unloading boxes into the new home. Unpacking items from boxes in the new home is generally not included and can count as an additional cost. If customers want movers to pack up their stuff into boxes, we only charge $40 an hour and depending on the location. Packing up fragile items in the kitchen usually takes longer than boxing up stuff in the bedroom. Stairs at the initial move site or the new destination can increase moving costs because they require more work for movers and present more possibility of injury or damage. We charge for stairs ascended, not for carrying stuff downstairs from the point of origin. If the move is into a fifth-floor walk-up, most we charge $75 per flight of stairs. Usually, the first flight of stairs is free, but it’s a good idea to clarify all of these details with the moving company when getting a quote to avoid surprises. When moving into a building with an elevator, elevator fee can be about $80, depending on the city. A moving company might waive the elevator fee if the building management is willing to dedicate an elevator to the move to help speed things along. When moving into a place where we cannot park directly at the door, moving company possibly can charge a long-carry fee, which is usually about $100 for every 75 feet from the truck to the door like i said possibly. Movers can solely assist with packing, loading and unpacking. These services cost less than if a moving truck is also requested. So if homeowners have their own truck, it can save money. Local or long distance moves don’t hesitate to contact EasygoMover..
EasygoMover located in Attleboro we served Massachusetts and Rhode Island. we are one -stop solution to all your moving problems.